Price FP-877 is £3.95, while FP 878 is £3.45. 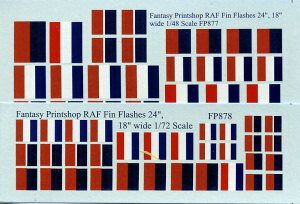 Another important component of RAF insignia are fin flashes. These sheets provide four of each of the most used versions in both 18 and 24 inch widths. FP877 is 1/48 and FP 878 is 1/72. The printing is first rate and shows no registration problems. This concludes all the new insignia sheets provided by Fantasy Printshop. In the past, things like this have sold out quite quickly so it would be a good idea to grab what you think you'll need at the first opportunity.